The next installment in the series would be You Only Love Twice, the first Bond film shot in Asia. The film kicks off with strange events in space as a mysterious contraption seems to be swallowing both the American and the Soviet spaceships. Before both the countries pin the blame on each other and jump into another world war, British government asks Bond carry out his investigations in Japan, where they suspect is the hideout of the spacecraft. Bond arrives in the oriental country where he is aided by the local force lead by Tiger Tanaka. He finds out that a local chemical company is shipping rocket chemicals surreptitiously into an unknown area. For this, Bond disguises himself as a Japanese even rigging up a fake marriage with Tanaka’s protégé Kissy Suzuki. Bond sets out on his gyrocopter to find the place, in vain. Finally, with the help of Kissy, Bond finds the secret lair where the craft is and successfully infiltrates it. 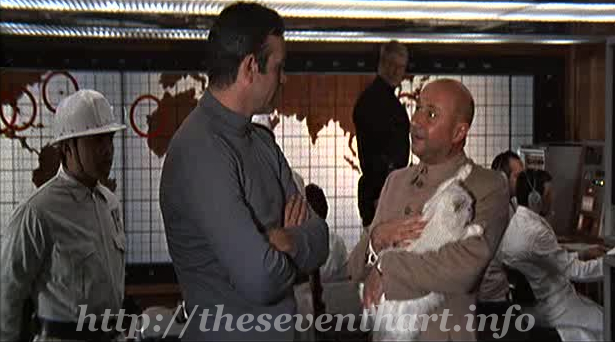 He meets the Number one of SPECTRE aka Ernst Stavro Blofeld! If Thunderball was deep inside the water, You Only Live Twice goes aerial. The plot is kept simple and would form the basis of another Bond film Tomorrow Never Dies (1997). You Only Live Twice, to an extent, makes up for the heavy blow dealt to the series by its predecessor Thunderball (1965). Blofeld (more famous as Dr. Evil in Austin Powers series!) makes his first appearance after indirectly threatening in previous three films. i can see you are doing overtime to write the “Bond countdown” series!! Great going, keep it up! !